I was showing the girls the "It's A Girl" card and I was asked if this would be my next class. Since I was racking my brain for ideas I agreed. Well, in looking around the room I could see that not everyone wanted a baby card. Hmmmm how could I make this an Easter card or a baby card. The photos tell the story. For this class you will be given a choice of baby or Easter. Bring a sharp scissors for a bit of fussy cutting. You may also want some pop dots, glue and your normal paper crafting supplies. Now for something a bit different....the second card is one that I will be posting on the Poppystamps blog page. That page won't go live for awhile, so I don't want to post the card here first. Karen has the card and if you'd like to see it, you'll just have to drop by Paradise Scrapbook Boutique. I think you will really like this card and if you like using dies, glitter and pearls, you will love it! The class is the second Wednesday of the month....I hope to see you there. Remember, you need to reserve your space, and kits are limited. 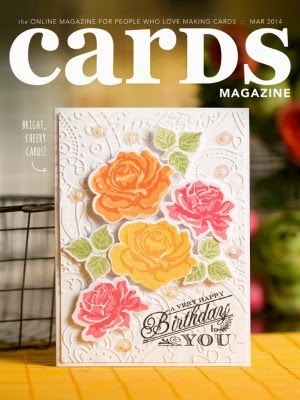 Saving the best for last.....I have some bragging to do.....My friend Jeanne has a card featured on the COVER. That's big, that's really BIG and I am very proud of her. Isn't this card B-E-A-U-T-I-F-U-L! Now when you look at the March edition you can say, I know that talented artist! Don't tell her I said this, but she not only is a very talented paper artist, she is one of the sweetest people I know and she's been so very helpful to me....she's paper talented and computer savvy! Congratulations Jeanne! Both cards are so pretty and have a vintage feel to them. I really like hoe you used the doilies for their BG and the DP you chose for them too!